- Tips:Playback via local micro sd card from APP,THE Micro SD card can not be read by PC.Up to 128G TF card(Card Not Included). - NOTE: 1. WITH ALERTS: If you want get alerts .you have to update 9.0 or above system version via your phone ,and can download the latest version of the software 2.0.8 . so you get alerts message via APP.2.NO ALERTS: :Once app installed, you do not receive alerts (even if banner at top of phone - iPhone 5s), you only get alerts when you open the actual app itself. - Service &Warranty: 12-months warranty. If you have any issuees in future. we will response within 24 hours.We take customers' satisfaction as our best reward. - Mini IP Camera with exceptional video quality and audio.185-Degree Wide angle view allows you monitoring your whole house with clear HD video.Built-in microphone and speaker can two way audio directly to your smartphone,as baby monitor. 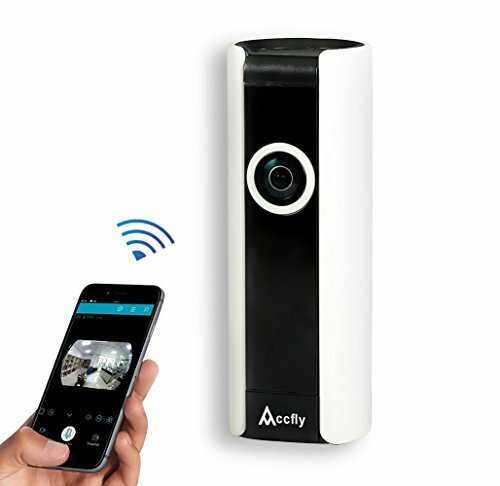 anywhere at home or in the office, you can keep a watchful eye on your home or business at anytime and anywhere. - Easy Setup,In order to use this device you will need to download an app for any smart device. The app is available for both Apple (IOS) and Android Devices. You can download it either via the Devices App store or direct link or via a supply QR Code. It supports motion detection,auto-recording and can auto-capture dynamic images.Records video clips when there any motion events detected. You can also remotely view live video from Smart Phones, iPad and Android Tablet.